Our risen and ascended Lord in the midst of his church declares, in the Revelation of St. John, “I am he who searches mind and heart, and I will give to each of you as your works deserve. ” (Rev. 2:23) This is the picture of himself which Jesus paints in today’s parable of the Pharisee and Tax Collector. Both of these men entered the temple before the holy presence of God almighty.Jesus’ teaching about these two men at prayer is a fearful commentary about Himself and His relationship with His church; that He is the One “who searches the minds and hearts,” He is the Shepherd of the flock “who divides his sheep from the goats” (Mt. 25:32).Jesus’ teaching this morning can also be a comfort to us as He reveals how you and I can stand truly righteous, that is “fully justified,” before God. This morning as we have been bold to enter into the presence of God almighty in public worship, let us pray the prayer of David who, when confronted with his sin cried out to the Lord, “Wash me thoroughly from my iniquity, and cleanse me from my sin! For I know my transgressions, and my sin is ever before me” (Psalm 51:2,3)This is virtually the same prayer spoken by the Tax Collector, v. 13, “God, be merciful to me a sinner!” This is the prayer of the of the one of whom Jesus says, “this man went down to his house justified” (v. 14). Jesus searches hearts for faith. This parable of the Pharisee and Tax Collector most surely gives the Christian pause. Both men, like us, earnestly came to “church” and were praying to the same God, the God of their fathers,Abraham, Isaac and Jacob; or so the Pharisee thought. Jesus says of His relation to His church, “I am the good shepherd; and I know my sheep, and they know me” (Jn. 10:14). This is the essence of our Christian faith, that we know Jesus and in Jesus, God.The Pharisee may have thought he had come to God in prayer, but his words were blasphemy. Not knowing God rightly, the Pharisee saw God as hard and demanding,a God who demanded that everyone who called upon Him must do his duty in order to be heard. The Pharisee understood his duty.He took it quite seriously.And he wasn’t willing to do just the bare minimum.He didn’t fast just a few times a year as was expected.He fasted twice a week.He didn’t just give a tenth on some of his income.He tithed on all of his income.He didn’t just do what the law required.He went above and beyond the law’s demands.He took his religion seriously.He gave thanks to God.He did his duty. If more people practiced their religion with the seriousness of that Pharisee the world would be a better place.When he contrasted himself from other men he was not lying. He didn’t extort money from others the way tax collectors did.He didn’t cheat his neighbor.He didn’t commit adultery.He was a decent man and a good citizen.And he thanked God for it.He saw what a righteous man he was and did not neglect to give credit where credit was due. He thanked God.He remembered that he owed thanksgiving to God for God’s great generosity toward him.So he went to the temple to offer praise to God.His work, his leisure,his social life,and his travels did not keep him away from his religious duty.But he did not go home justified. Like Cain in the Old Testament, God did not accept his praise.God did not receive his thanksgiving.His worship was in vain and his duty was left undone Unlike King David, this Pharisee came before God without recognizing the least sin in his life.Rather, he brazenly gives thanks for being made perfect and wonderful;placing himself as one whom his “god” dare not condemn. In his holiness and mercy God through Jesus has dealt with the curse which is sin. And sin, the reality of which Pharisees, old or modern, refuse to recognize, stands as a un-breachable wall, a separation between God and man that duty and right living cannot correctBut God in Christ does not ignore reality or the cause of our separation from him. In Christ He has confronted sin and has defeated it. “You were dead in the trespasses and sins in which you once walked, following the course of this world, following the prince of the power of the air, the spirit that is now at work in the sons of disobedience—among whom we all once lived in the passions of our flesh, carrying out the desires of the body and the mind, and were by nature children of wrath, like the rest of mankind.But God, being rich in mercy, because of the great love with which he loved us, even when we were dead in our trespasses, made us alive together with Christ—by grace you have been saved—and raised us up with him and seated us with him in the heavenly places in Christ Jesus,so that in the coming ages he might show the immeasurable riches of his grace in kindness toward us in Christ Jesus.For by grace you have been saved through faith. And this is not your own doing; it is the gift of God, not a result of works, so that no one may boast. For we are his workmanship, created in Christ Jesus for good works, which God prepared beforehand, that we should walk in them. Both the Pharisee and the Tax Collector prayed. But the Pharisee receives judgment and the Tax Collector is justified. What was lacking? Faith was lacking. But surely the Pharisee believed in God! He took God’s law seriously. He went to God’s temple to pray. He thanked God for making him the man he was. How can anyone say that the man lacked faith? He certainly gave greater evidence of believing in God than do those who don’t bother to go to church at all or only when they feel particularly religious. And they claim to believe in God! Surely the Pharisee believed in God! Well, yes, he did, after a fashion. He believed that God was good. He believed that God blessed him with good things. He believed that God required obedience. He believed that God calls on us all to do our duty. If this is what faith is then the man had faith. But this is not what faith is. Faith is the gift of God. God creates and strengthens faith in your heart only afterhe humbles you. Whoever exalts himself will be humbled. It will happen now or it will happen on Judgment Day, but it will happen. You cannot exalt yourself. God is not impressed by our claims. When we presume to think we are more righteous than others we need to remember that God knows how righteous we reallyare. He doesn’t look merely at the outward act. He sees every motive. He knows where our hearts are. He understands sin better than sinners do. The wisdom of the world says that if you just make better choices, if you but do your duty, if you just would live by the Golden Rule. My dear lambs of Jesus’ flock, while living by these maxims may truly enhance your relationships in this world, they will not enhance your relationship with God. We must be abased. We must be humbled. And God Himself must do it. When He does He is preparing us to receive the gospel. St. Paul, is a bold teacher, seeming at times to contend even with God. St. Paul wishes himself “accursed” for the salvation of the Jews (Rom. 9:3). Which of us would dare utter such a prayer for fear it might come to pass? And yet most of us, who recognize the horror of sin which clings to our flesh and in which we continually take pleasure, might argue with St. Paul when he claims to be “chief of sinners” (1 Tim. 1:15). In Christ we not only know our Lord to be holy and pure; but by his light we acknowledge our sin which is ever beforeus. St. Paul stakes his claim to being “chief of sinners” on two counts; that he was a Pharisee par excellence (Phil. 3:5), and also that he persecuted Christ himself by arresting the saints and attempting overthrowing apostles, pastors and teachers. If we examine our consciences by the Light which is ours in the grace of Christ, we must acknowledge with David and the Tax Collector, our lusts, advantageous oppressions, and our injustices toward one another. And when we are not doing these evils; then too often (perhaps even in church) we promote ourselves to God on account of our good works–great and small. Because our sin is continually with us, Jesus commends to us the mind and the heart of the Tax Collector, who, “beat (continually) his breast, saying, `God,be merciful to me a sinner!.”It is the Tax Collector who displays a heart and mind for which Jesus searches,which knows and worships the only true God in truth and in faith. As horrible as St. Paul’s, or the Tax Collector’s, or our sins are to contemplate, as awful as it is to admit that all sin, any sin is unjust adulterous rebellion against the holy God; we must see by grace that which grace has revealed–that Jesus, for love of us became Chief of sinners, or in St. Paul’s words, “For He made Him who knew no sinto be sin for us, that we might become the righteousness of God in Him” (2 Cor. 5:21) As both the Pharisee and the Tax Collector made bold to appear in the Temple of God and offered their prayers to God,so also many people today claim a personal relationship with Jesus. By today’s parable we are to observe that it is Jesus who searches the mind and the heart and that his sheep know him first and last because Jesus is God’s plan of salvation, God’s solution to our sin; and by this grace we know Godas a God of mercyand of love beyond our abilities to comprehend. Because we know our God as merciful we know that Jesus, “who searches the minds and the hearts,” does so with theintent of creating and maintaining in each of us our saving faith. It is that of which Paul speaks when he says, “For by grace you have been saved through faith. And this is not your own doing; it is the gift of God, not a result of works, so that no one may boast. For we are his workmanship, created in Christ Jesus . . .” (Eph. 2:8-10a)Did you hear it? God has created you in Christ Jesus. In Jesus you are a new creation (2 Cor. 5:17) and in relation with God almighty, holy and pure, just has he has made you brand new. If we have a personal relationship with Jesus it is founded and lived out in this reality that he became “sin for us” and by the power of this amazing good news we have new life in the presence of Jesus, Emmanuel, God with us. By his actions, his atoning blood, by faith, courses through our veins, daily cleansing and purifying our hearts and minds, our very souls; for in love he is always searching us to our core. When a Christian boasts that he or she has been cleansed by the blood of Jesus we must recognize that this is not some abstract and distant thought about Christ’s crucifixion. When Jesus walked the earthhe preached the kingdom of God in our midst (Lk. 17:21). 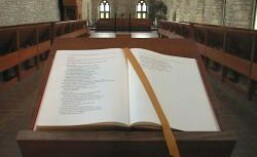 This same preaching is the ministry of his church, It is the mission of this churchto preach the forgiveness of sin in Jesus, by whose personal presence the Kingdom comes to us.When we are in the saving “real” presence of our Lord by his word and sacrament, we participate in his most holy and precious blood. Participating in Jesus’ blood means being involved with Him on the most intimate of terms;letting Jesus clean us up, not just once but always. We might think of a baby who does nothing but be fed by his mother; and when satisfied, soils himself and his clothing. It is a marvel to watch a loving mother joyfully clean up the child and the mess he has made. It is the same with Jesus and us. By his shed blood,the blood into which he was baptized for our sins, he is faithful to make us clean before God, the holy Father. This is our faith. Apart from our sin, which is always soiling us and those with whom we come into contact, we have no relation with Jesus. Yes, as we mature in the faith, the joy or our salvation takes on various and pleasing dimensions, but always first in Christ. Jesus is our older brother when we are lost and in need of direction; he is the lover of our souls when we are spiritually distressed; he is the source of all our good and gracious blessings in this and the life to come; he gives us his own Holy Spirit enabling us to lead lives pleasing to the Father. Jesus is the Promise of God which fulfills every blessing ever given by God to man, and more. As we spend more and more time in His company through His word, we come to acknowledge these various and wonderful aspects of our personal relationship with Jesus. and by that mercy, we are justified. This entry was posted in Sermon and tagged Luke 18. Bookmark the permalink.